We are an extremely nice group of people who practice to get better together in a fun and supportive environment. We meet Sundays from 6-8 pm either weekly or monthly in two distinct seasons. November through April: weekly meetings, and the second Sunday of the month is free! We will not be meeting on November 25 and December 23. May through October: monthly meetings, and all jams are free! These open practice jams have no formal instruction, and are geared as a time to play, practice, socialize with other hoopers and flow artists, and dance to the music. All ages, experience levels, and flow disciplines are welcome, and those under 15 must be accompanied by adults. There are a ton of hoops, and some juggling equipment, poi, and a set of fans available for use if you don’t have your own. 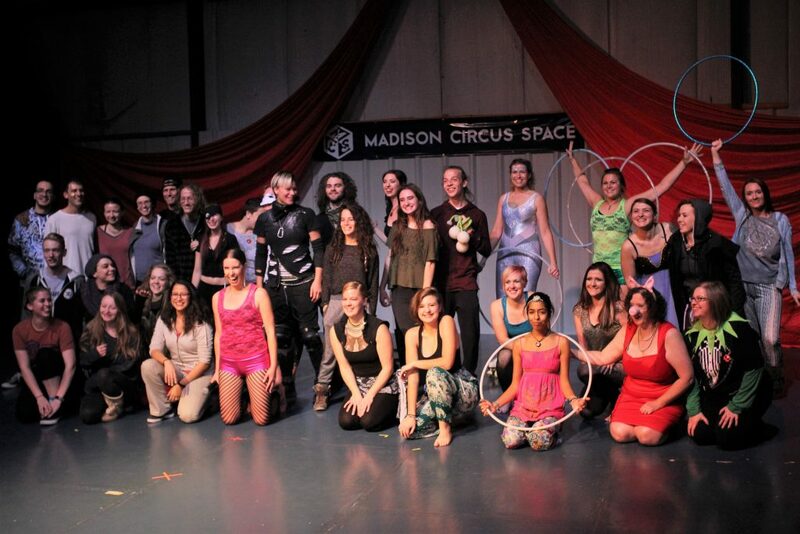 The Madison Circus Space features high ceilings, a sprung wood floor, and also has mats and a mirror available for use. There is a ton of space to move in. Please check the Hoop/Flow Madison Facebook Page for any cancellations or changes to the schedule. We often cancel around holidays or for neighborhood festivals. The cost to participate is $5 individual / $8 family to drop in or $20 individual / $30 family for an 8-pass. The 8-pass may be used within one year of purchase.